Hi. My name is Mikey. I was sick. I wasn’t hungry. I’m better now. I am hungry. Cheese is good. 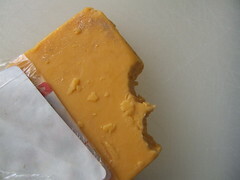 I think I’ll go bite into a brick of cheddar. Go ahead and click on it. You’ll go to my flickr page and there you will be able to enlarge the image. Go ahead. I’ll wait. Are you back? Did you notice that smudge in the upper right hand corner? Do you know what that is? IT’S GLITTER. My cheese has glittery bite marks. I really don’t think I can top this. I think I just need to admit that there is no better favorite moment. 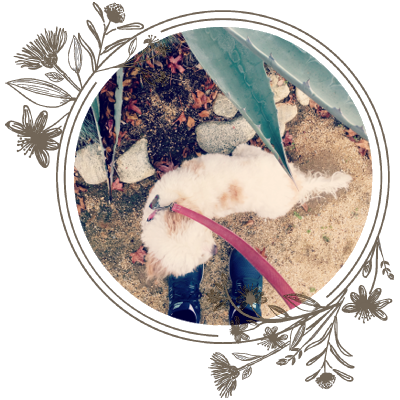 I’m debating just shutting down the entire blog and calling this my final post. I mean, cheese with glitter and indentation marks? You can’t make this stuff up. 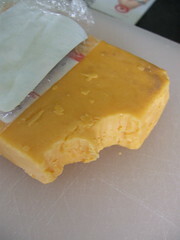 One last picture of the cheese from a different angle, because this had The Mister and I laughing hysterically. It’s a brick of cheddar. This is no meager Kraft Single. How hungry was he? Where was I? And what does so much cheese taste like all at once? There are so many questions that will never be answered. The crap. The glitter. The dog kibble. The cheese. I love it. As crazy as it sounds, I really do. I can’t wait until Nicholas is old enough to charge through the world making chili and fruit salad while eating bricks of cheese. For now, I’ll just snuggle him and wait with a smile on my face–and a drink in my hand. I LOVE IT!!!! Glitter on the cheese. You’re right, you can’t make this stuff up. It’s true, as crazy as the stories goes… you cannot make it up and you just have to live in the moment and savor every single moment because they grow up so fast. See now I’m back to wanting to be a mommy. I just love to read your stories. You have such a great perspective on thigs. Maybe you should hold on to that glittered cheese idea, it might make a great holiday gift. Well he does love Mickey Mouse after all. Isn’t it logical he would love cheese as well? Hehe. I personally love the fact he got the cheese, unwrapped the cheese, ate the cheese, wrapped the cheese back up, and never said a word. I wish he was in my preschool class. I would have so much fun with him. What an imagination! Just the bite marks had me smiling and then you mentioned that glitter! Hahaha! That’s so great! When we have similar moments like that, I would give any amount of money to be a fly on the wall and just watch while they do their little secret deeds. So cute! It’s those little moments/things that catch you completely off guard and make you laugh that make parenting so much fun. Glitter cheese….that’s a winner! I’m glad you guys found it as funny as I did. :) I’ve come back to this post a few times to reread it just for the chuckle it gives me. Patricia–I would have loved to be a fly on the wall, too! Cara–that’s so funny! I bet your parents were trying hard not to laugh! Seriously, that is the funniest thing EVER. My goodness, he’s a wonderful little guy to give his mom such great bloggy stories to tell. I don’t think you have to close down the blog – with that kind of mischievous genius he must only be getting started.